Hello Friends, Here I am again with another creative challenge. This one is fromAud Sentiment Challenge Blog. I love this challenge. It was to use a tag on the card and the sentiment was to be on the tag. I love love love working with tags. If there is ever a swap involving a tag, I am all in.. There are so many things you can do with a tag, I know, you can do equal things with a card but I just love the tags. On this tag, I clear heat embossed a tim Holtz image and then I sponged distress ink in different colors all over the tag. I then added the sentiment and the film strip ribbon. I embossed the green panel with a Tim Holtz alterations embossing folder then I ran a Radiant Rain dabber from Luminarte all over the embossed green panel to add some sparkle. The final touch was the washi tape along the edge. I love how this card turned out and I hope you all enjoy it as well. Let me know what you think!!! All for now and I will be back again to share some creative goodness with you all! 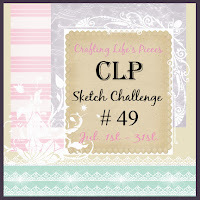 Here we have another great sketch from Crafting Life's pieces challenge blog. The image I used is from The Greeting farm, Isn't she just so cute? I colored her in with my Copics in Pinks and blacks. The designer papers I used, Once again, from a 6 X 6 paper pack and this one being from Echo Park. I love the blacks and pinks together. So darn purty!! You can barely tell, but I sprayed all of my flowers with a coordinating Tattered angels glimmer mist to add some sparkle. I love sparkle!! I then used the bitty banners from stampin in Happy Birthday and then cut it out with the bitty banners Framelets from Stampin Up! I really really like this creation. The only bad thing about me liking it is, I end up holding onto it when I should be sending it to someone special. LOL! So, there you have it. My take on the sketch from CLP, Let me know what you think!! Nighty Nights all, I will see you all real soon!!! A quickie sketch challenge card for you all to enjoy. I found this sketch challenge blog thru Feline Playful. Oh what a great site. Feline Playful has a daily list of ALL challenge blogs, whether it be sketches or color challenges. It is there. This challenge is from Deconstructed Sketch. Oh what a great site as well. This was a great sketch and so much fun to complete!!! My image is from CC Designs and colored in using my Copics. The designer papers are from a 6 X 6 pad from My Minds eye. I love love love the 6 X 6 pads. You see, I am a total paper hoarder, so having the 6 X 6 pads saves me on space and also scraps. At least that my justifying it, LOL!! Anyways, I wanted this card to be in summer colors, bright and pretty! The sentiment is from Stampin Up! Itty Bitty Banners and then I cut it out with the Stampin Up! Bitty Banner Framelets. 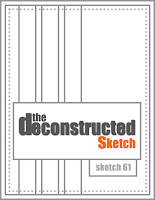 There you have it, My creation for the Deconstructed sketch challenge. What do ya think?